On a daily basis, things get screwed up. Some screw-ups are small and can be remedied easily, others are big ones. Some are caused by people and others are out of our control. 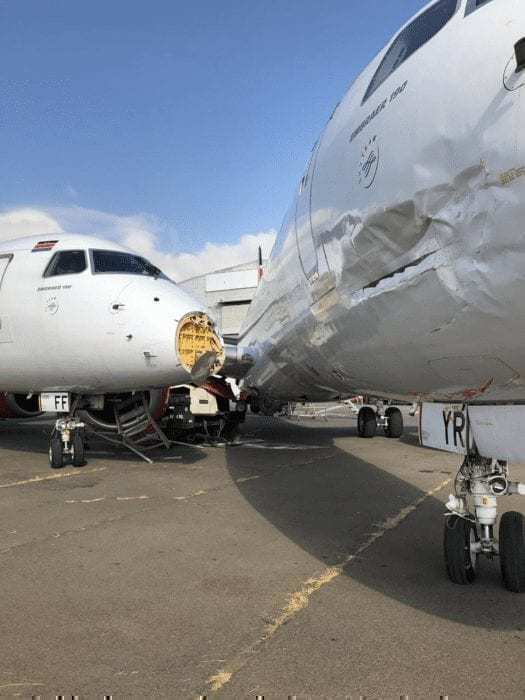 Well, Nairobi airport got to see a screw up involving two Kenya Airways E190s. It seems that, on the evening of February 8th, there was a routine maintenance check being done for the engines on the E190s. Somehow, one of the planes didn’t have the proper brakes and collided with another E190. 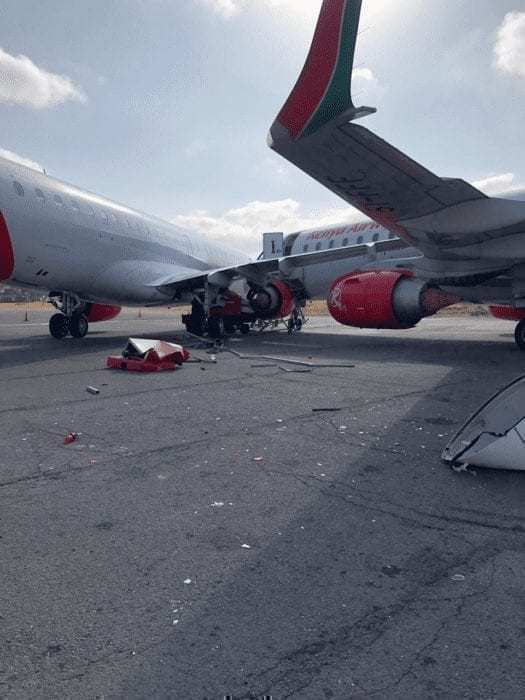 According to a statement released by Kenya Airways, there were no injuries to any maintenance staff members. 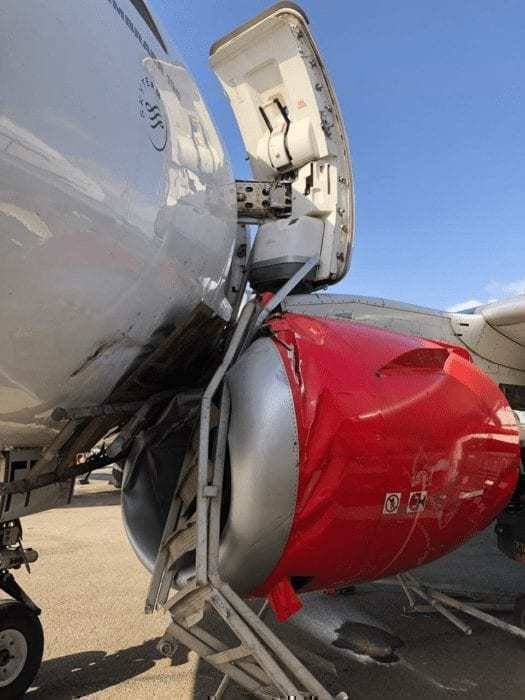 It seems like the aircraft in motion ended up dislodging the radome of one E190 and stopped when the engine rammed into the fuselage. Both aircraft received substantial damage and will have to be overhauled before returning to passenger service. Luckily, these were two E190s and not two newer (and more expensive) 787s that Kenya Airways flies. The two aircraft can be identified with the registration codes 5Y-FFF and 5Y-KYR. 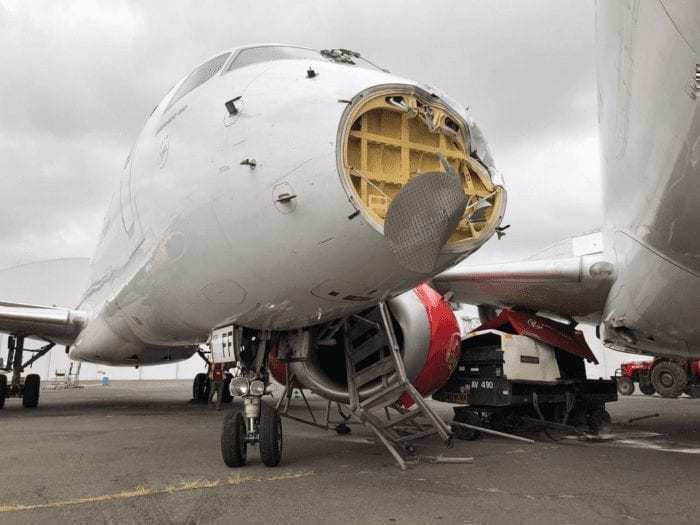 Airport collisions do occur and this is not indicative of a careless safety pattern at Kenya Airways. The good news is that there were no passengers on either aircraft and there were no substantial injuries. Given how this incident occurred in a maintenance area without any passenger terminals, it seems like the disruption to other flights was minimal. Nairobi airport is still operating as normal. Kenya Airways, a Skyteam member, will take a financial hit with multiple canceled flights and repair to both aircraft. It is also possible that Kenya Airways may look to lease an aircraft in the short-term to stabilize operations which would be an added cost. Recently, Kenya Airways has been struggling financially and have been looking for ways to turn around and reach profitability. This incident will not help them much. Kenya Airways is looking to use its fleet to expand its route network and reach greater profitability. Currently, several widebodies are being leased out to Turkish Airlines and Oman Air. From Turkish Airlines, Kenya Airways will see the return of three Boeing 777-300ERs and Oman Air will return the 2 787-8s. Kenya Airways intends to expand flights to key destinations in Africa, Europe, and Asia. Given how Kenya Airways has struggled with their New York route, it should be warning for Kenya Airways to be more careful with an aggressive route expansion. Anyone who has been in a car accident knows how expensive those repairs can be. For an aircraft, the expenses are much higher with examinations, repair, and compensation for canceled or delayed flights. We hope to see these Kenya Airways’ E190s flying again soon! What do you think about this funky situation? Let us know in the comments below! We called it a chock or a wedge, triangular in shape, usually in a pair connected to each other either by a short length of rope or metal bar. Whether plane has brakes or not does not matter as long as chock is in place on any of the wheels – nothing move! These chocks cost you peanuts compared to yr 2 planes’ repairs! You learn quick, put into practice immediately and if you make the same mistake again, you’re just another idiot! Thank you for the terminology! When I was referring to brakes I did mean both the chock and the actual brakes on the plane. From the pictures, it seems like there are no chocks. Thank you for visiting our site and reading our article. I appreciate your viewpoint, however I respectfully disagree. The article in no way attempts to humiliate Kenya Airways or make humor of a situation that is less than ideal for a flag carrier. 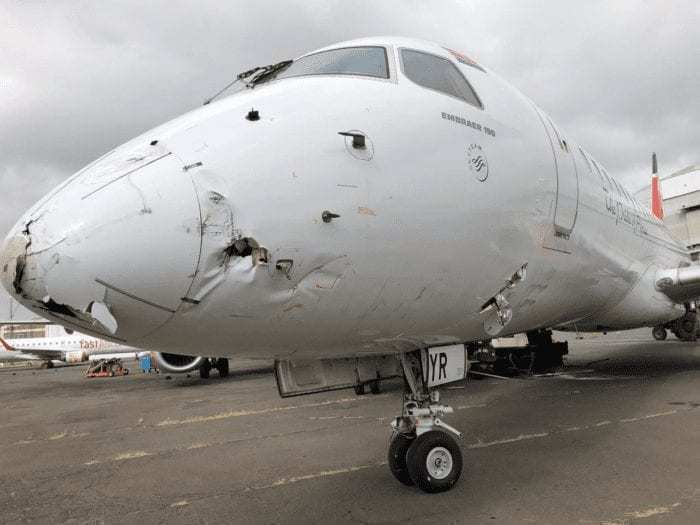 I stated in the article that this is not indicative of a careless safety pattern at Kenya Airways. Aircraft collisions do happen. The difference is this is a more substantial collision than we have seen recently. The good news is that there were no injuries. I would fly Kenya Airways in a heartbeat if I were heading to Kenya. I’m sorry if you felt offended in any way, but there are better ways to address concerns than by implying the author has mental issues. That is offensive. Thank you for your comments, we appreciate our readers’ interactions with our articles. Hmmmm… reading the article from a very neutral viewpoint, I will concur that in no way the writer attempts to humiliate the airline. Instead I found the article to be very objective in nature, giving a broader perspective of the incident, particularly this being an aviation news blog. No one wishes any airline misfortunes, but it is a fact the KQ has been struggling for sometime. Like the writer put very well towards the end of the article, We hope to see these Kenya Airways’ E190s flying again soon”. This comment should not have been published since its accusations (“terrible choice of words”) and (“humiliating an airline”) and (“poor attempt at humor”) and (“you need counseling”) are unsubstantiated or even briefly discussed. No discussion at all regarding the “conclusions” reached by the writer. Akin to being guilty without due process. Much of that going around. Great article, Jay !! !